Broken rice, a byproduct of the rice milling industry was utilized at different levels to evaluate unleavened flat bread (chapatti) making properties of whole wheat flour. Chapattis were prepared by replacing whole wheat flour with broken rice flour up to 50% level. Mixolab studies revealed that incorporation of rice flour lowered dough development time and dough stability of whole wheat flour up to 23.49% and 78.33%, respectively. Lower retrogradation was observed in whole wheat rice flour blends as revealed from soluble starch/amylose. A positive correlation of mixolab retrogradation was observed with soluble starch and soluble amylose. 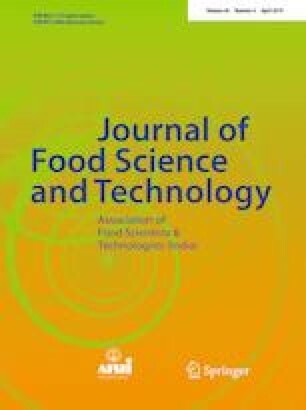 Whole wheat flour chapatti (fresh and retrograded) containing different level of rice flour were also evaluated for glycemic index (GI), rapidly digestible starch (RDS) and slowly digestible starch (SDS). Chapattis containing rice flour demonstrated higher GI and RDS but lower SDS. RDS correlated positively with GI. Chapattis from the whole wheat rice flour blends had good consumer acceptability.